Once the hot water streams through, most people toss spent coffee grounds in the trash – but not Audrey ­Finocchiaro. “In my personal life, and in the company, we try to be socially responsible in any way we can,” said the co-owner of Providence-based mobile coffee company The Nitro Cart. Finocchiaro found a second use for the still-potent byproduct of her clients’ caffeine habits one day on Instagram. 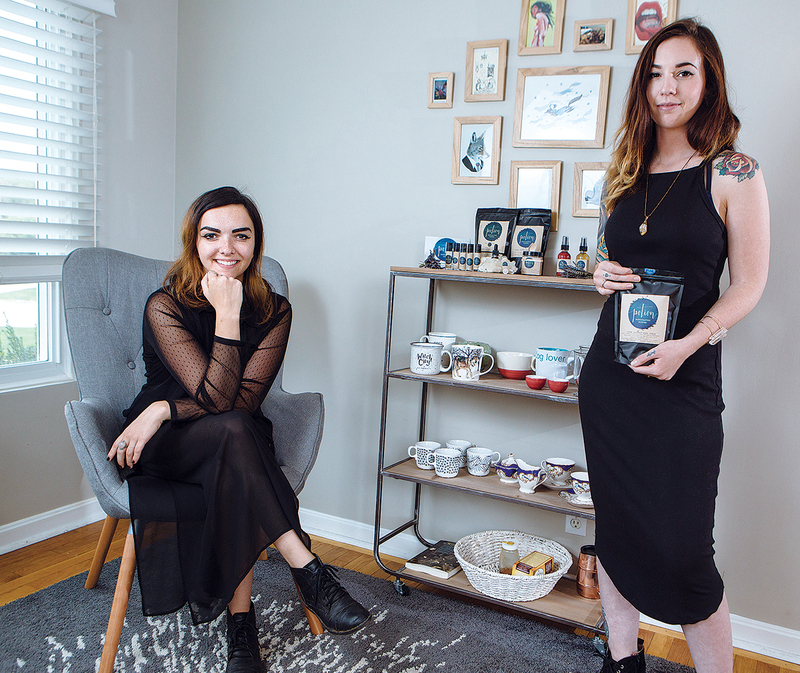 Not long after the company’s one-year anniversary, her feed played matchmaker when it suggested she check out the profile of Providence-based beauty-products manufacturer PotionPVD. She messaged PotionPVD asking if they were interested in the coffee grounds – “We go through a lot and we hate to throw them away,” she said. Now, The Nitro Cart donates spent grounds to PotionPVD to use as an exfoliant in its coffee body scrub and sells it fresh grounds as the base for its coffee eye serum. Both products were named Nitro in an homage to the partnership. “Their coffee has a very distinct [odor], it brought our scrub to a whole new level,” said Viana Newton, PotionPVD co-owner. In The Nitro Cart’s 19-month history, Finocchiaro said business-to-business relationships have been integral to brand growth. Begun as a physical cart in May 2016, by the end of summer 2017 Nitro Cart coffee was being sold at 32 local restaurants and bars, said Finocchiaro. Its five employees also sell coffee Monday through Friday from two carts in the capital’s East Side. She credits much of the company’s success to the generosity of local hospitality business owners who supported The Nitro Cart in the early days – “even though we were 23 and knew nothing” – a mentorship it emulates with new, especially women-owned, businesses it encounters. The “collaborative” relationship between The Nitro Cart and PotionPVD “is a unique example” of business-to-business bonding, said Susan Barber, vice president of operations and general manager at Waltham, Mass.-based Smaller Business Association of New England. “I’ve never heard of microbusinesses sharing like that,” she said of the coffee-grounds exchange. Mark S. Hayward, district director of the Rhode Island branch of the U.S. Small Business Administration, believes there is more collaboration among Rhode Island small businesses today than in the previous 30 years. He called these alliances “critical to the sustainability” of retail companies with a handful of employees but does not think they are specific to New England. Launched in May, PotionPVD is the brainchild of former roommates Newton and Katie Bouchard. The pair believe linking with an established company in the capital city helped spread awareness and tap into a pre-existing customer base. While she admits these relationships have pushed the two to “step out of our comfort zones,” Newton said she’s learned PotionPVD exists in a niche. “Usually the small-state thing can get in your way because [the market] is saturated, but in our case it’s helped,” she said of the company’s use of unusual ingredients. PotionPVD’s Etsy shop features the Nitro-inspired products, as well as pomegranate tea face scrub, Himalayan sea-salt spray and rose-water toner. Newton and Bouchard also sell in local stores, including shops in East Providence, South Kingstown and Pawtucket. Like Finocchiaro, Bouchard and Newton want to use this type of relationship to grow their business in an organic, sustainable fashion. So far, they’ve established ties with Blue Skys Farm in Cranston and hope to find a farm in Rhode Island growing roses year-round. Similarly, those is in the farming business are also trying to connect with the state’s retail sector. Rachel Playe, owner of 3-year-old Radia Herbs, headquartered in Providence, cultivates a Cranston farm for most of the ingredients she uses in her herbal products and homewares. However, she purchases beeswax from an apiary in her hometown of Northbridge, Mass., for use in candles, pine salve and lip balms. Playe said she prefers partnering with other small businesses because they’re a “reliable source.” Herself a sole proprietor, she said it’s important to know where the ingredients come from, how much is available and have the opportunity to buy in bulk for a cheaper price. “It’s also helpful to know you’re [investing] your money locally and enriching somebody in your community,” she said. Playe’s small-business networking has been so successful, she hopes in the coming years to expand her farm and branch out into dried herb sales – a market she says has “lots of demand” in Rhode Island. Cary Collins, Providence College’s Ruane endowed chair in business innovation, said these microbusinesses may be having such networking luck because of their location. “Providence is the sharing community,” he said, explaining the lack of business diversity lends to “kismet” collaboration such as that between The Nitro Cart and PotionPVD.